With its old-world grandeur and innovative art, food and culture scene, Vienna is one of the most exciting cities in Europe to spend time in. 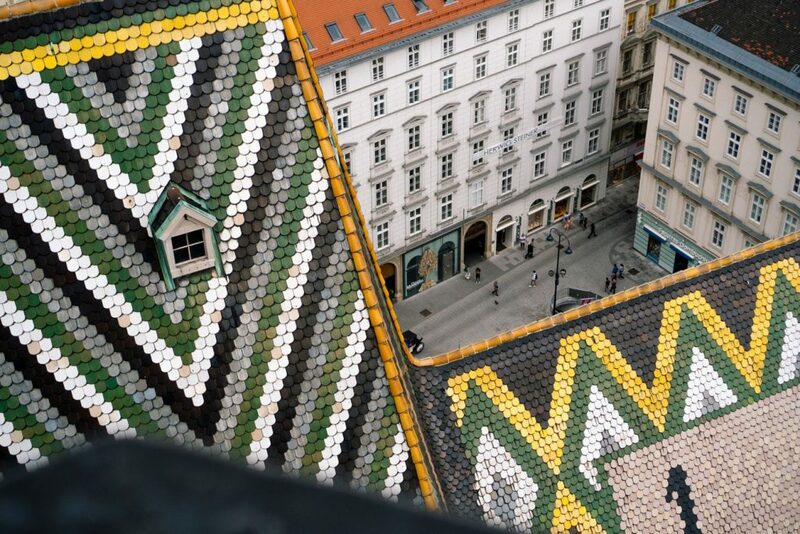 There’s history everywhere you turn but don’t think that there’s nothing more to Vienna than the past; new things are popping up all over the place and keep the capital fresh and contemporary. If you’re there in winter, enjoy Gluehwein at the famous Christmas markets and ice-skate around the majestic town hall; in summer, stroll in the parks and head to the outdoor swimming pool. No matter the season, there are museums, palaces, and shops that can keep you busy for days. From old imperial homes to modern art galleries, there’s something here for everywhere. The evenings are equally as magical. Whether you want to embrace sophistication without breaking the bank at the Viennese State Opera or dance till dawn at one of the epic clubs, you’ll definitely have some nights to remember. There’s a huge range of food options, from traditional Sachertorte to trendy pop-up food halls. Not to mention some fabulous accommodation if you are wondering where to stay in Vienna. 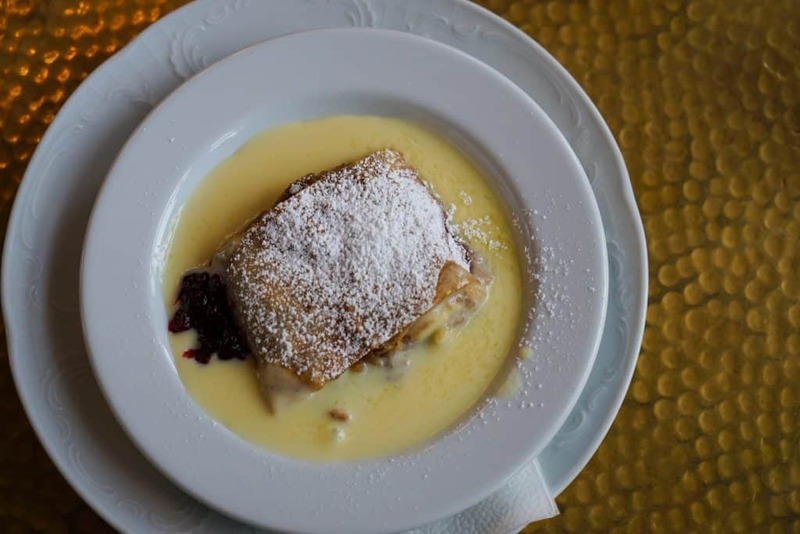 Despite all that’s on offer with these Viennese things to do, you might also want more from your Vienna trip. It’s great to visit a city but you’ll also want to really get out and experience Austria and even the surrounding countries; Vienna is incredibly well-connected. So here are some fabulous ideas for day trips from Vienna to get you inspired. A very highly recommended day trip from Vienna, this adventure to the UNESCO-listed Wachau Valley is a great way to discover the beauty of the Austrian countryside. A bus will take you from the heart of Vienna into landscape that feels straight out of a dream. 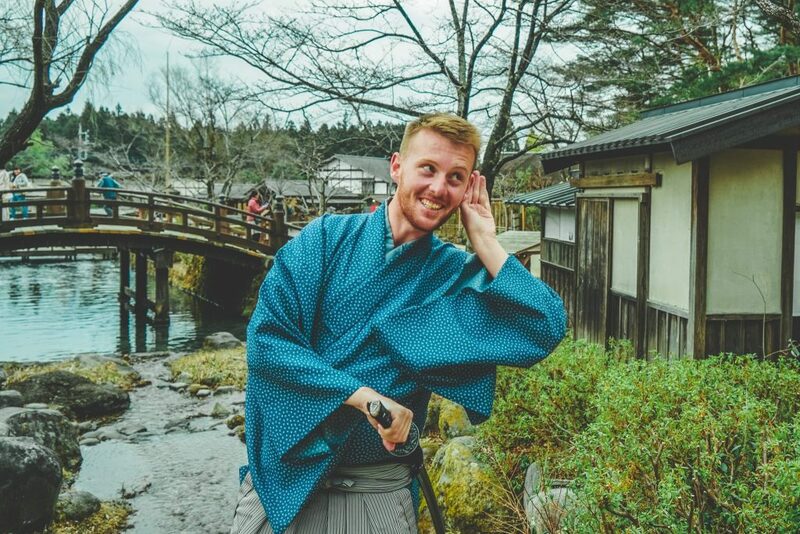 There’s a local guide with you to ensure you don’t miss any of the sights and to give you all the interesting facts and stories about the region. Vineyards and forests, picturesque villages and historic abbeys decorate the rich scenery. It’s an area of natural beauty for good reason, and the perfect antidote to the hustle and bustle of the city. You’ll pass by castle ruins before catching a boat in Spitz, which will take you down the Danube to Melk. We always love seeing a country from the water and this is no exception; watching the banks of the river slip by is a soothing method of sightseeing that we could get used to! 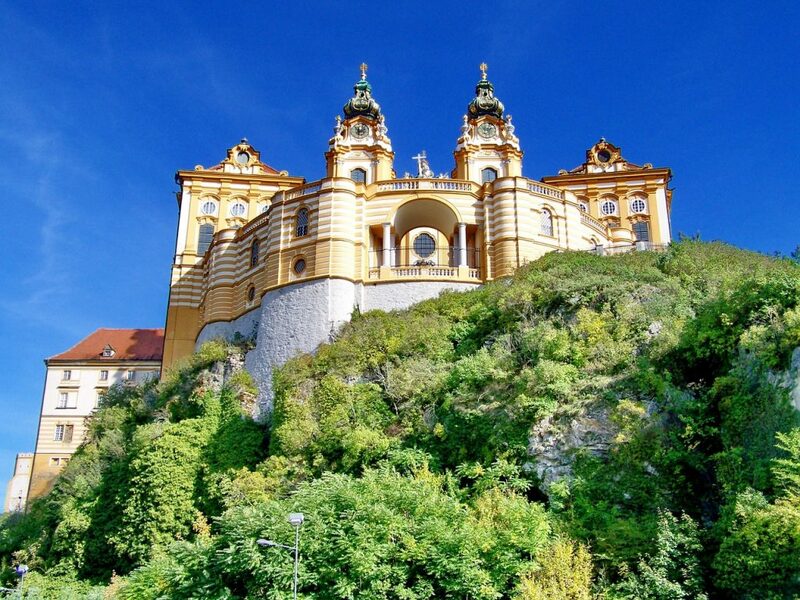 In Melk is the 11th century Baroque-style Melk Abbey. Not only is the architecture fascinating, with colourful frescos and beautiful views, but there is also an incredible library. Think of Salzburg and you might immediately think of ‘The Sound of Music’ (we know we do! ), but there’s lots more to Salzburg than that. This is one of the most jam-packed day trips from Vienna we’ve been on – however, every moment is worth it. Not only do you get to experience Mozart’s birthplace, you also get a wonderful tour of the beautiful Wachau valley and Salzerkammergut mountains. That’s right, three UNESCO-listed things in one day! 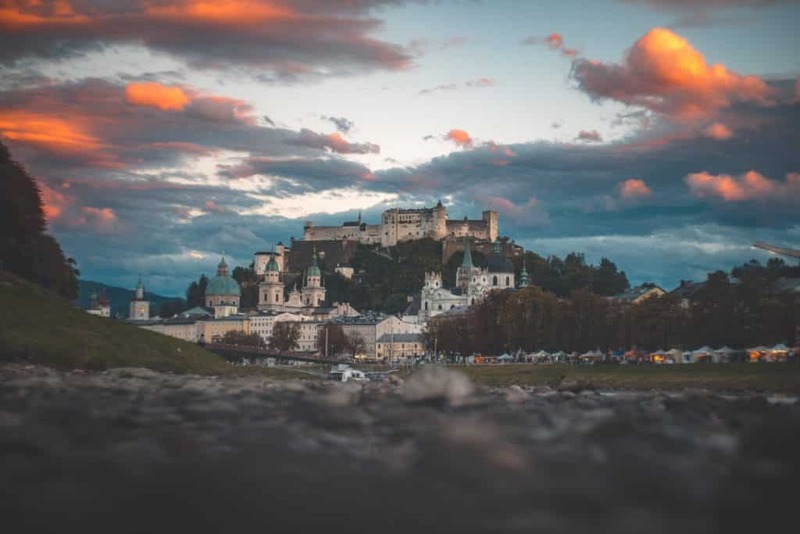 After passing through the glorious landscapes, with guided commentary included, you’ll tour some of Salzburg’s highlights including Mirabell Palace and Gardens, the Cathedral and Mozart’s House. You also get a chance to explore on your own, a freedom we always enjoy on day trips. After seeing the setting of the musical you might be inspired to twirl in the mountains on your way back – alas, you might have to settle just to enjoy the views! Perhaps your fellow travellers might be willing to join in on ‘Do Re Mi’ but we can’t guarantee it. One of the reasons we like this trip so much is because it’s a great way to make the most of visiting a city right in the centre of Europe, where other great places like Salzburg are so accessible. There are times when the beauty of a place stuns you; you stop in your tracks, can’t think of what to say, can’t believe that such a place exists. You’ll experience plenty of these moments on this Alpine trip. You might have already got a taste for Salzkammergut on your journey to and from Salzburg; or perhaps you’ve heard about it from others. Either way, this is definitely one of our most highly recommended day trips from Vienna. Wandering in the heights of the mountains, it’s hard to believe there’s a buzzing cultural hub only hours away; you feel on top of the world. On the bus journey you’ll get panoramic views of the surrounding scenery before stopping at one of Austria’s oldest abbeys, Admont Abbey. Here you can see the world’s largest monastic library set in the grandeur of the Baroque architecture. 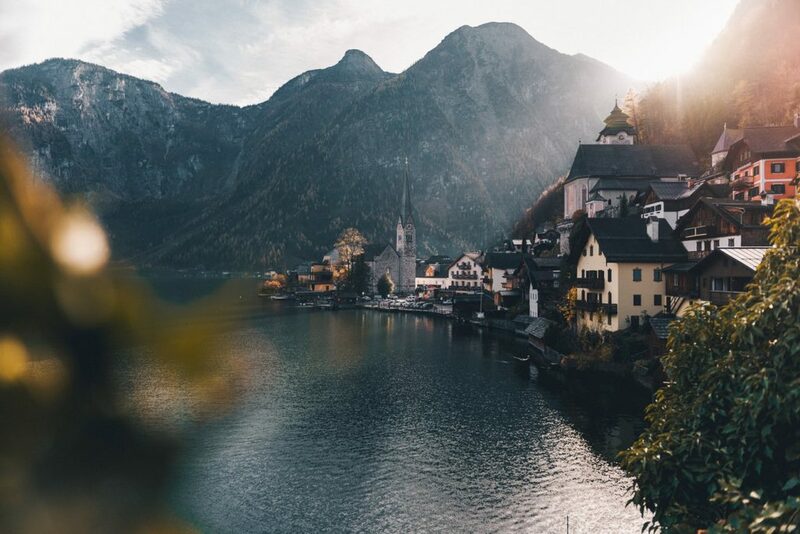 Walk with a guide along the picturesque banks of the lake near Hallstatt village and learn more about the region and its history. After Hallstatt you’ll go to Gmunden, a riverside town with a history of craft making. There are plenty of shops and workshops to explore so it’s a great place to pick up presents! Among the many gorgeous sights you’ll see is the Ort Castle, seemingly floating in the middle of a lake. It’s just one magical moment of many on this day trip to another world. Because why be limited to just one country? We’ve mentioned already (once or twice!) 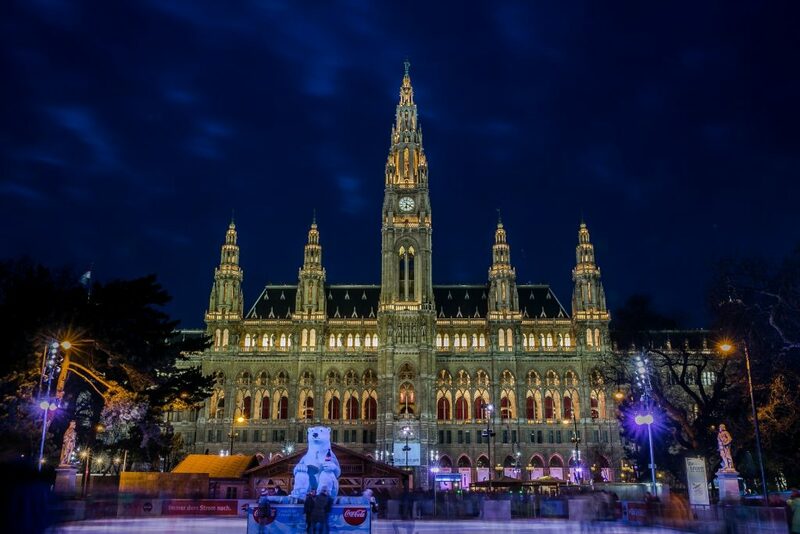 that Vienna is incredibly central and well-connected; this is one example of how you can take advantage of that, as Hungary and Budapest are only a day trip away. 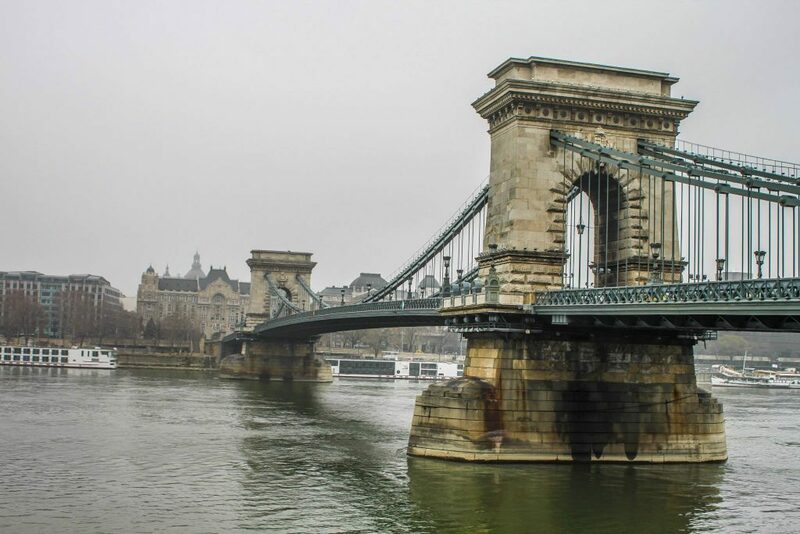 You can spend time discovering Hungary’s capital, see some of the beautiful scenery both countries have to offer and gain a deeper understanding of the history of the area. On the way to Budapest your minivan or coach takes you through attractive east Austria while your driver tells you more about the region; you then cross the border at Hegyeshalom, passing historical towns on your way to the capital. The symbol of Hungary is a mythical bird of prey, something you won’t forget after seeing the hilltop statue of it! But this is all just lead-up to the main event, the gorgeous and vibrant city of Budapest. A city of two halves: a medieval district (Buda) and the commercial hotspot (Pest). The mighty Danube separates them, providing a unifying core to the city. 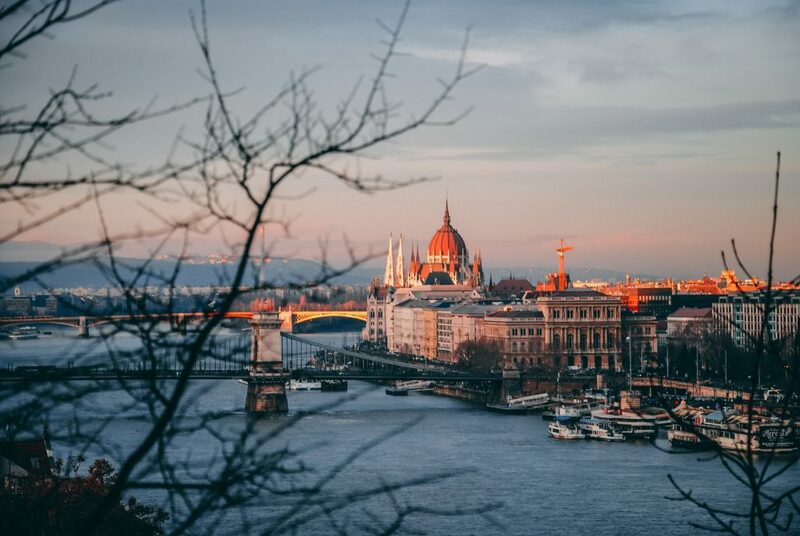 In Budapest, you’ll find plenty to explore, from the Castle District and the Fisherman’s Bastion where you can get stunning views, to the Hungarian State Opera and Vajdahunyad Castle. If you’re tired after all of this excitement, don’t worry; you’ve got plenty of free time to discover the city independently. Choose whether you shop, do more sightseeing or enjoy some of the delicious food (we vote the latter!). The choice is yours – just make sure you’re on time for the bus to take you back to Vienna, as tempting as it might be to stay in Budapest a little longer! Even closer to Vienna than Budapest is the Slovakian capital of Bratislava – in fact, there’s only 67km between here and Vienna, so it makes the perfect day trip. We also love this option as Bratislava is smaller, so it feels more manageable and you don’t get the sense that you’re missing something! It’s only a one-hour drive to Bratislava, so you feel like you get lots of time there. While the coach journey is a great opportunity to soak in more of that breathtaking scenery, we’d really recommend opting for a boat trip back. You’ve got the time, after all, and it’s a wonderful chance to see both cities from a different angle. It’s a high-speed catamaran, so you adrenalin junkies also get a bit of a hit! The morning in the city is spent on a walking tour with a guide who will give you the history of Bratislava from a local’s perspective. See many of the architectural treasures on offer as you stroll through the Old Town to Grassalkovich Palace and Primate’s Place. The former was the place for Hungarian aristocracy to see and be seen, while the latter is one of the most beautiful buildings in the city. 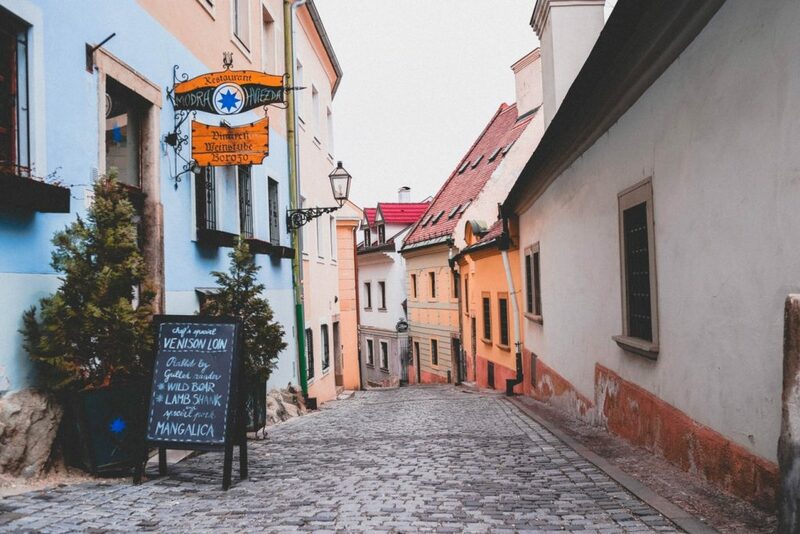 After all this walking, you can put your feet up with coffee and lunch in one of Bratislava’s many cute local cafes. Then it’s up to you – shopping, more coffee, a drink or sightseeing. We like that we have the option. 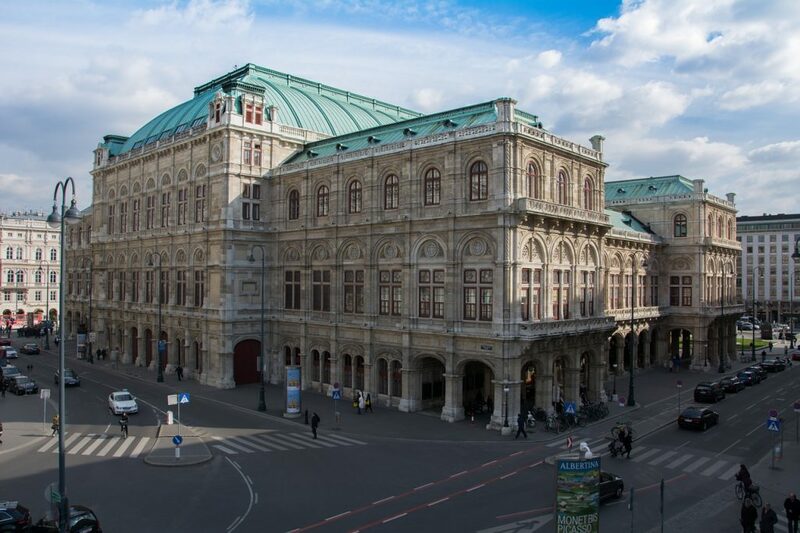 We all travel to widen our horizons and these day trips from Vienna give you the opportunity to do that; learning more about nearby places helps you understand this fascinating city even more. Still Wanting More?  What About These Other Tour Ideas From Vienna?